This is one of the few instances where I can flatly say that I have no idea where I heard about this band. Somewhere in my online record shopping excursions, I must have stumbled across this album and made a mental note to check them out at some point. 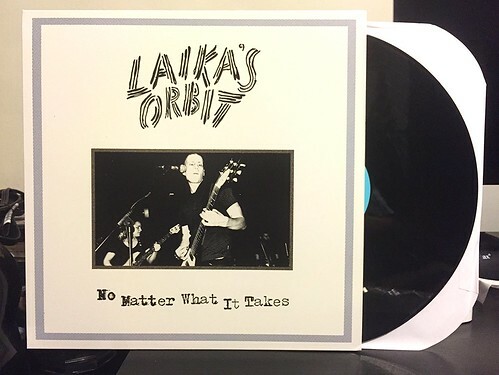 I flicked through a few songs on the Laika's Orbit Bandcamp page and then ordered the LP. I wish I could thank whoever had drawn my attention to this record, because I absolutely love it. This is the sort of perfect, medium-fi, bouncy pop record that I could listen to a hundred times a day. Upbeat and energetic with killer vocal melodies and so many hooks that I'm almost tempted to write a bad analogy to compare the record to something that has a lot of hooks. The first reference point that I immediately hear is the band Title Tracks, who coincidently had put out one of my favorite LPs of the past several years back in 2011. I also think that fans of The Yolks would be into this, though Laika's Orbit strikes me as much catchier. Did you like White Wires? Probably a good idea to check this record out. I love everything about this album from the jangle of the rhythm guitar to the slight fuzz of the vocals to the perfect drumming and the bouncing bass lines. This is absolutely, no questions asked one of the top five records I've heard this year. Probably top three really. I can't recommend it highly enough, especially if you are into any of the bands I mentioned way back in paragraph two. Seriously, go buy this right now.